It’s the most extreme time of the year again as ‘X Games 18’ kicks off tonight in Los Angeles with Skateboard Big Air and Moto X Freestyle. Live coverage of the event begins at 9 pm EST on ESPN 2 and online with Watch ESPN and ESPN 3D, but if you aren’t able to watch all the high-flying action when it first airs, you can visit FreeCast the following day and we’ll help you watch ‘X Games 18’ for free online. 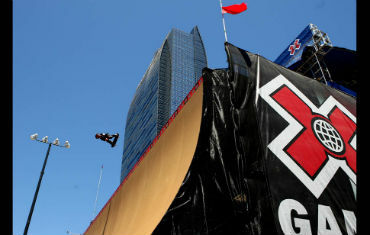 Leading off ‘X Games 18’ on ESPN 2 is the Skateboard Big Air competition, which viewers can start watching tonight at 9. Last year’s Big Air winner and X Games regular Bob Burnquist, 34, will look to take home his second straight gold medal in the competition as he faces some stiff competition from the likes of Sandro Dias, Jake Brown and several others. Brown, who nearly died during the Big Air event three years ago after a 45-foot free fall, took home the X Games gold medal in Skateboard Big Air in back-to-back years before Burnquist ruined his hopes of a 3-peat in ‘X Games 17′. You can find coverage of the intense Skateboard Big Air competition live on ESPN 2, or you can visit FreeCast and we’ll help you find all the ‘X Games 18’ events online for free the day after they air. Extreme sports fans can also watch the Moto X Freestyle competition between 9 and 11 tonight on ESPN 2, or online starting tomorrow with FreeCast. It was Nate Adams who won the gold medal in the Moto X Freestyle last year, edging out Adam Jones (silver) and Dany Torres (bronze). All three are expected to compete again tonight in ‘X Games 18’s’ Moto X Freestyle competition. Visit FreeCast to watch all of the ‘X Games 18’ events the day after they air on ESPN or ESPN 2.